Plus there’s Conor McGregor – the man for all seasons – as well as a wonderful insight into Tony Keady. 1. “’You could just tell, he was just like a robot. You’d see a flaw that a lad has got and you’ll try iron it out, it’ll take a few sessions. With Carl, you’d say it once and then boom, he’d never do it again. He was programmed, he was awesome, you’d be doing pads with him and you’d be trying to find faults. He was so schooled. Following Carl Frampton’s split from Barry McGuigan, Irish-boxing.com’s Joe ‘The Writing Pride’ O’Neill speaks with Frampton’s first pro trainer, Kevin Maree, who explains why he was frozen out of ‘The Jackal’s team. 2. On Saturday night the fans saw McGregor go toe-to-toe with one of the all-time greats and deliver a performance that compares favourably with what top boxers like Manny Pacquiao and Canelo Álvarez did against Mayweather. McGregor had put it all on the line and done himself and his sport proud. Ken Early theorises in The Irish Times that Conor McGregor remains the man for all seasons. 3. Diamond [Screech]: I think he did fine. 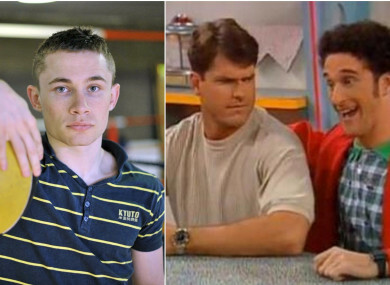 If you’re Academy Award quality, then you probably shouldn’t be on Saved by the Bell. If you’re less than Academy Award quality, then you shouldn’t be on Saved by the Bell. You’ve gotta be right in the middle there. … I think he fit right in that smooth spot. Engel: He was playing himself. That’s not hard to do. You just play yourself. Harbaugh: I was not great. Not even good. That’s just my review. … I felt like I was doing a lot of overacting. When I first saw it and when I see it today, there’s a lot of overacting going on by me. Chantel Jennings of The Athletic provides an outrageously entertaining oral history of American football coach Jim Harbaugh’s appearance as ‘Screech’s cousin’ on Saved by the Bell: The New Class. 4. “He was more than just a caretaker looking after the school here. He was everything from the class comedian or clown to the principal. He was helping guys – bringing lads lunches, making sure they had a pair of togs or small things like making sure they had the school uniform to avoid getting a tick. Cian O’Connell of GAA.ie speaks to Pat Malone, Eanna Ryan, Pearse Piggott, and Pete Finnerty about the late, great Tony Keady. Donald McCrae speaks to England cricketer Sarah Taylor in The Guardian about conquering depression, and how her craft suddenly became a breeze. Email “Frampton before the spotlight, Jim Harbaugh on Saved by the Bell and the week's best sportswriting”. Feedback on “Frampton before the spotlight, Jim Harbaugh on Saved by the Bell and the week's best sportswriting”.